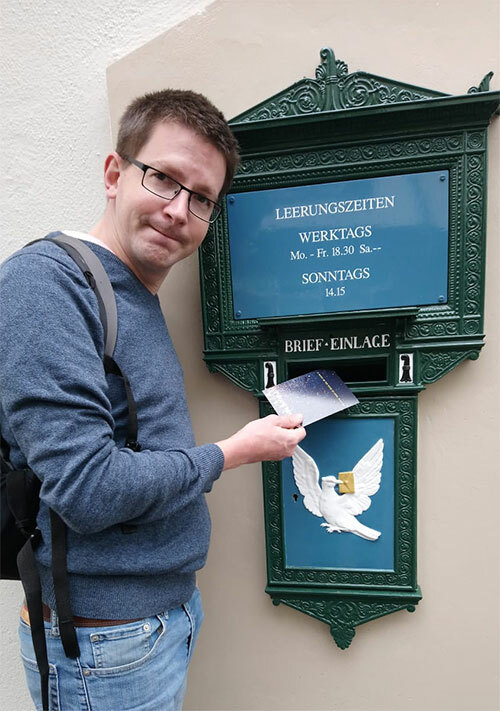 During the summer, British Postcrossing members and old university friends Richard (aka roestimann) and Adam (aka mluc32) met in the city of Basel with a mission: to find all of the six “Basler Dybli” maiboxes! Why are these mailboxes special, you ask? Well, for one, they’re beautiful! They were designed by Swiss architect Melchior Berri between 1843 and 1844, when Basel re-organised how mail was transported in the city. Upon completion and installation, they were considered the district mailboxes and served as direct connections to the postal network. Local postmaster Johannes Bernoulli liked them so much that he requested 10 more to be made — and a stamp as well to commemorate the occasion! 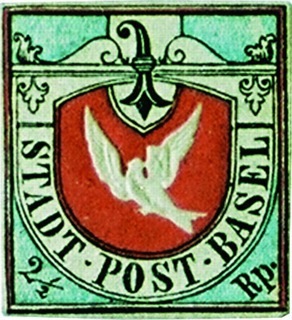 The stamp issued in Basel (this was before Switzerland had a unified post office for the whole country and cantons could issue their own postage) was called “Basler Dybli” (or the Basel Dove). The 2½-Rappen (cents) stamp was launched on July 1st, 1845 and featured an embossed white dove on a field of red, carrying a letter in its beak. Amazingly, almost 175 years later, these beautiful mailboxes featuring the same dove motive are still in use! Richard and Adam located all six of them, mailed some postcards from them and took some photographs to document their outing in Basel. 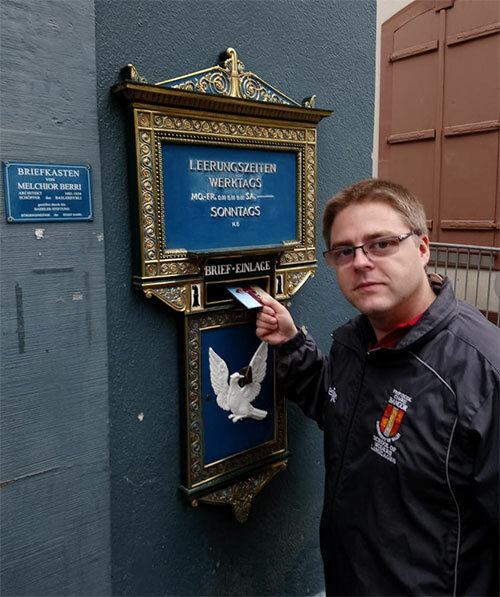 If you’re ever in Basel and are curious to follow their footsteps to discover these special mailboxes, you can find them at: Spalentor, St. Alban Vorstadt, Münsterplatz, Schneidergasse, Lindenberg (Kleinbasel) and at the old chambers in Riehen, which is a little outside the city. What a brilliant postal adventure! 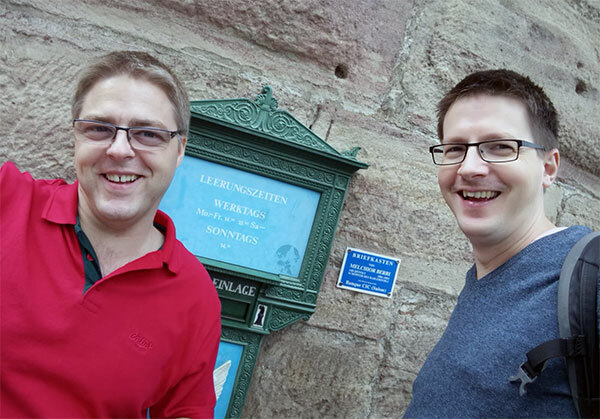 Thank you Richard and Adam for taking us along on your trip around Basel to learn some interesting facts about the postal history of Switzerland! The Little Mail Carriers at Toronto's First Post Office! 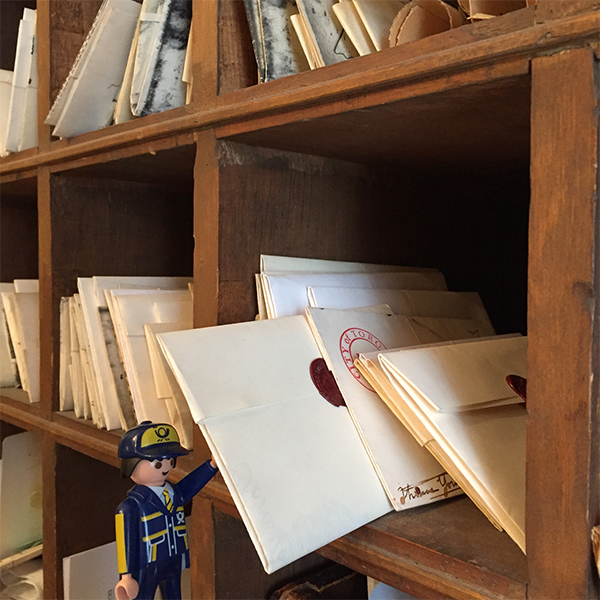 The Little Mail Carriers continue their adventures around the world, and this time they’ve received an invitation they could not refuse… to explore Toronto’s First Post Office! They jumped at the opportunity to discover this historical institution, which is both a museum and a post office and is also regularly visited by the local postcrossers. Kat Akerfeldt is a curator at the museum and kindly offered to show the little ones around. Hi everyone! 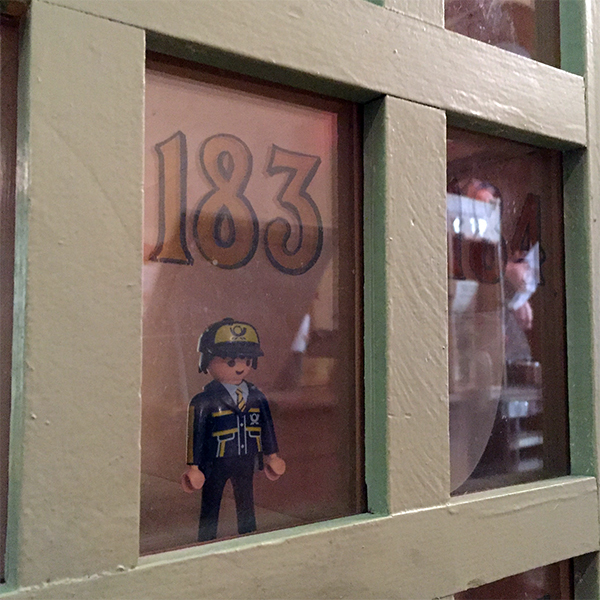 We’ve just arrived here at Toronto’s First Post Office, but it seems like we came at a very busy time of year! To make us feel right at home, Kat put us to work in the Post Office, sorting mail and making sure that everything went into the correct box. 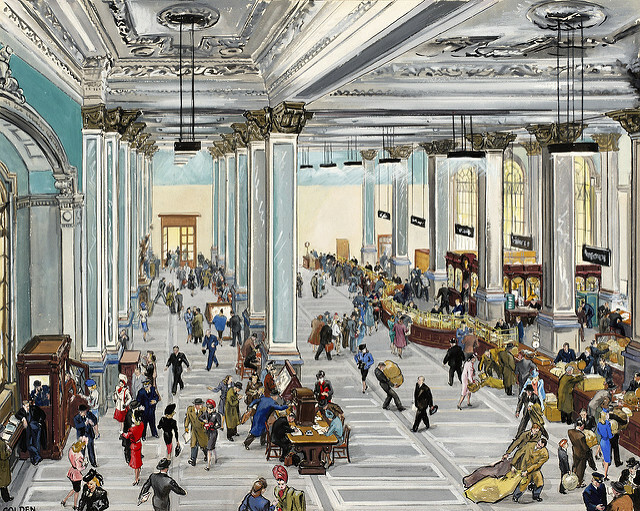 Toronto’s First Post Office is a museum, and looks just as it did in 1833. That was when the city’s first Postmaster, James Scott Howard, built the town’s first brick Post Office. At that time, everyone in Toronto collected their mail from this Post Office – there was no home delivery then. 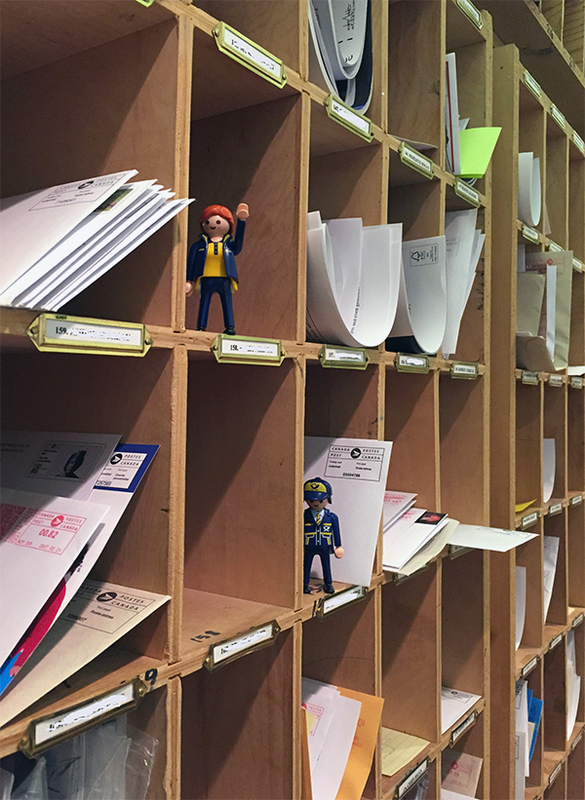 Most letters would be sorted alphabetically until the recipients called for them. Only a few people had their own P.O. box, with a window with a number painted on the glass. These were for Toronto’s early government, business, and religious leaders, for they received the most mail. Today, Toronto’s First Post Office still runs a full-service Post Office, and offers P.O. boxes to rent to members of the Town of York Historical Society. 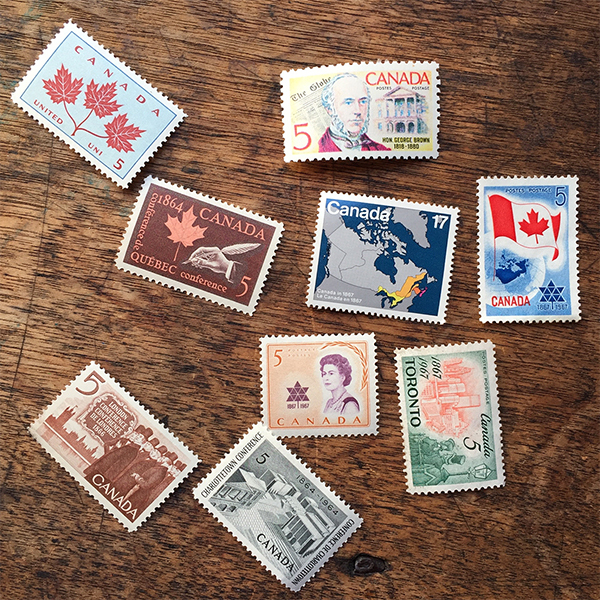 It’s the only postal museum in Canada, and the only Post Office in Toronto to offer a pictorial cancellation mark, so they get a lot of visitors who want to send interesting happy mail — including lots of postcrossers as well! … but soon emerged again to find out what all the noisy excitement was about. Turns out, a school group had arrived and wanted to learn to write letters as they did in the 1830s in Toronto. 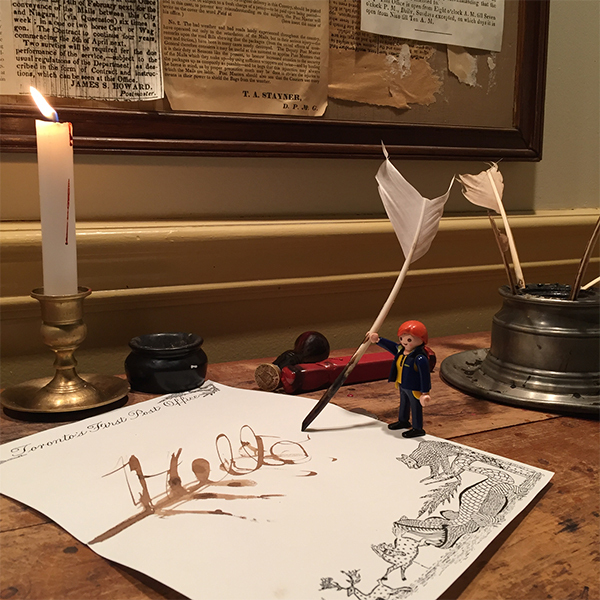 We learned that writing with goose quill pens isn’t always easy, and that blobs will happen! The Postmistress reminded the class to keep a light hand, keep the paper flat on the table, and keep the pen moving! 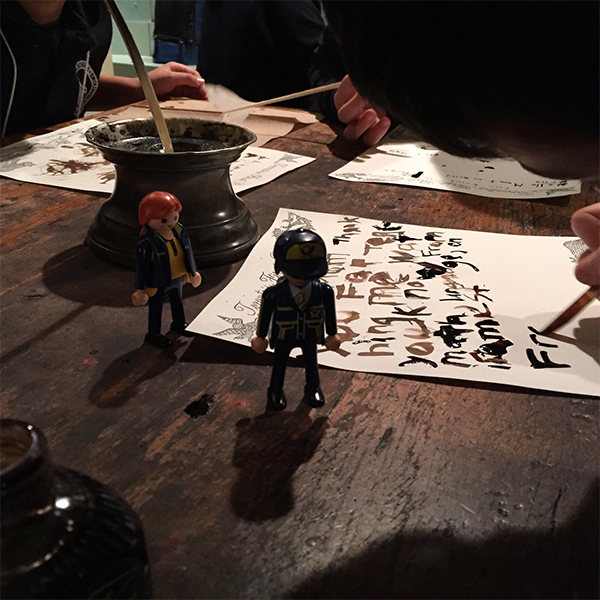 When the letters were dried with pounce (a sand, sprinkled onto the ink, which helps to dry it quickly), the students folded their letters and sealed them with red sealing wax. In the 1830s, you had to pay postage on every piece of paper, so you didn’t waste paper or postage on an envelope! The letter becomes its own cover. Finally, the letters were stamped with a historic cancellation. In the 1830s, Postmaster Howard didn’t like the quality of black ink, so his was the only post office in the province of Upper Canada allowed to use red ink. The date on the cancellation mark is historic in itself! 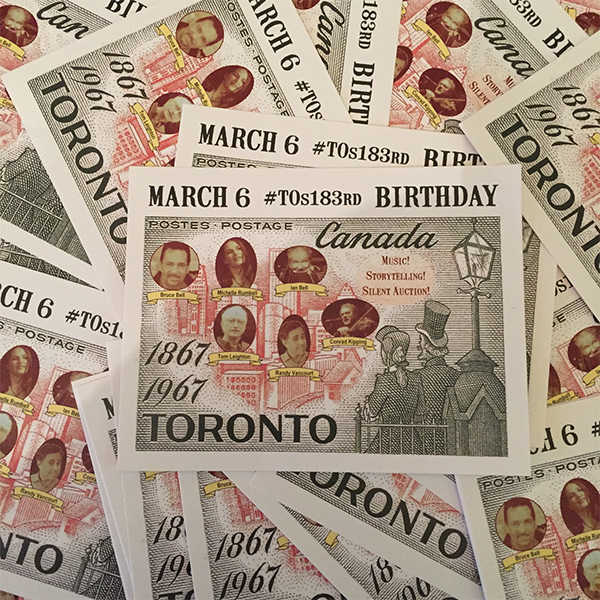 It says “March 6”, which is Toronto’s birthday! 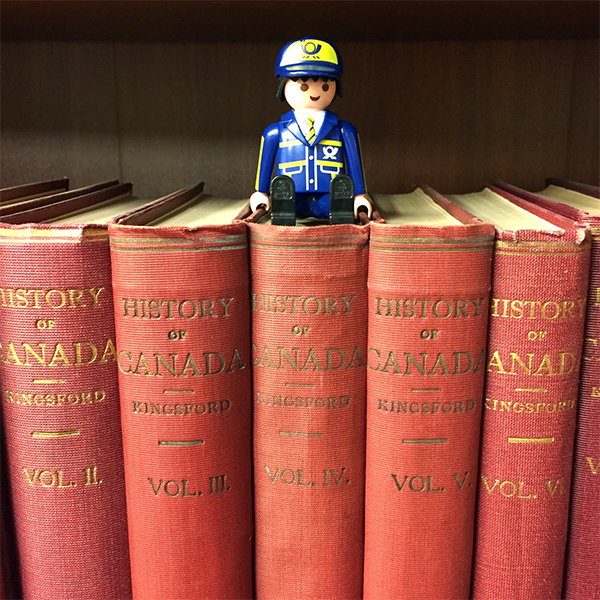 March 6, 1834, was the date that Toronto became the first city in Upper Canada. Before 1834, Toronto was known as the Town of York. And before 1793, as early European settlers came to the area, this place on the shores of Lake Ontario was known as Toronto. Toronto is from the native Mohawk language, and was sometimes spelled Taranteau or Tkaronto. In 1793, Upper Canada’s first Lieutenant Governor, John Graves Simcoe, moved the capitol away from the American border to Toronto, renamed the settlement after the Duke of York, and started a lot of development, including creating a map of his new Town – two blocks up and five blocks across. When Simcoe first came to Toronto/York, there were 241 people living here. By 1834, when it became a city, there were 9252 people living here. It had grown very quickly, but it didn’t stop there… Today, Toronto is nearly 3 million people! 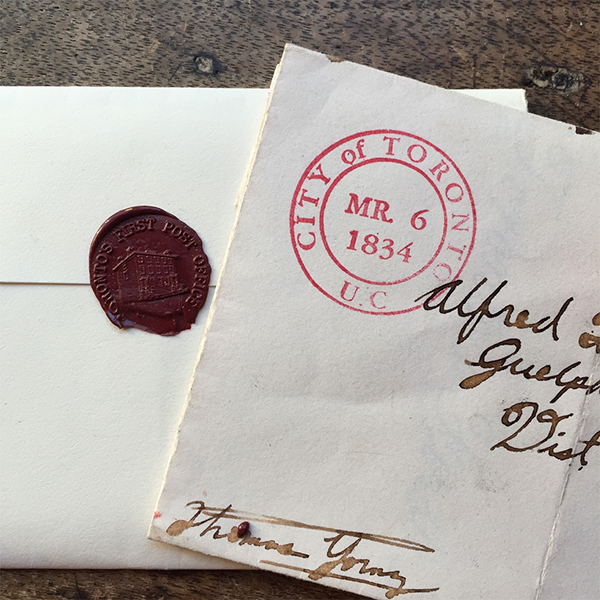 Later in our visit, we heard some very exciting news: every year, the Town of York Historical Society and Toronto’s First Post Office celebrate becoming a city with a gala celebration! This year marked the city’s 183rd birthday, and the celebration also honoured Canada’s sesquicentennial. A party was held at St. Lawrence Hall, which was built in 1851 as Toronto’s first big concert venue. During its early history, the Hall hosted debates on Canadian Confederation, was a terminus for the Underground Railroad, and the venue for three sold-out performances by Swedish superstar Jenny Lind. In 1967, the Hall was restored, and is now a National Historic Site. 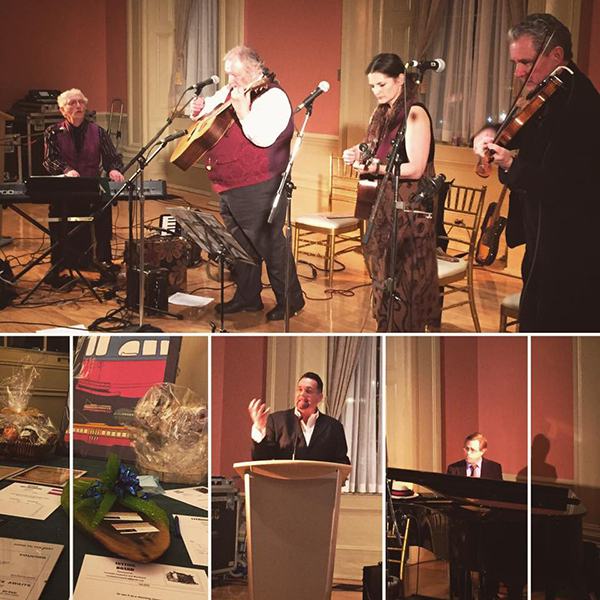 On March 6, 2017, the evening included lively music written in 1867 and 1967 (the number 1 song in Canada in 1967 was “The Letter”, which we thought was very appropriate! ), rousing speeches on Toronto’s history, and a very popular auction of goods and services from local businesses! Toronto’s First Post Office and St. Lawrence Hall are very close to the St. Lawrence Market, which is full of amazing food artisans, who very kindly supplied all kinds of good things to eat. We especially enjoyed the very Canadian delicacy – and very sticky – butter tarts! What an evening! After all the excitement, we were ready for some relaxation back at the Post Office. 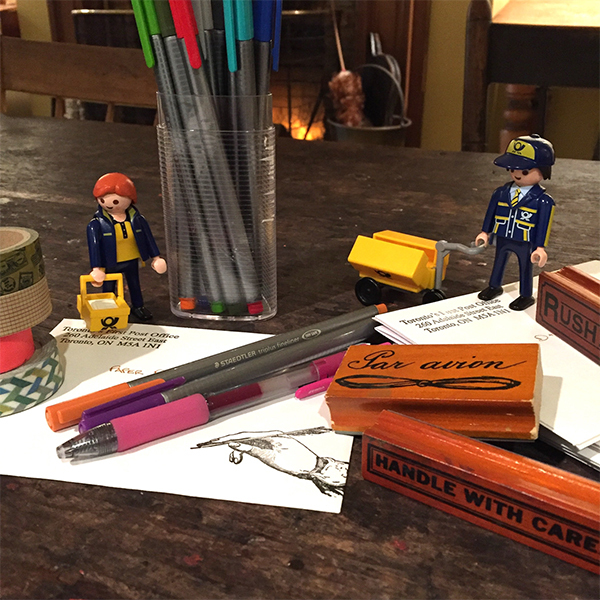 We settled in the Reading Room, in front of the fireplace, with our best pens and rubber stamps, to write some letters and postcards to our favourite people. 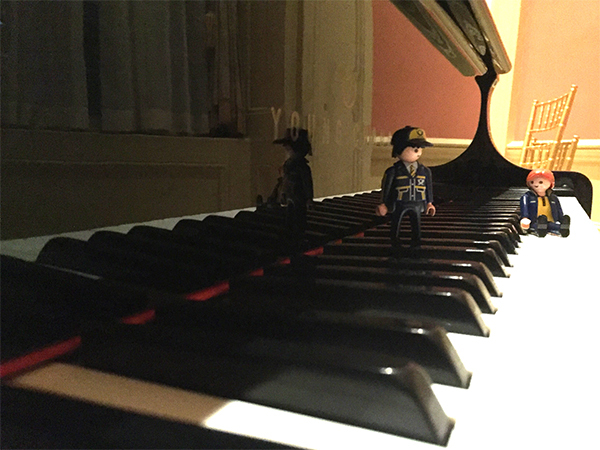 After all, how else would we enjoy a quiet moment? Thank you so much Kat and everyone at Toronto’s First Post Office, for taking such good care of the little ones!  Where will they go next? Alan (aka MindYerCar) from the UK sent us a tip to a radio series from BBC4 that aired some years ago. The People’s Post is a 15 part series of programs on everything Royal Mail: from the early history of the postal service, to reforms and modern day challenges. Most of the episodes are still available on BBC4's website for everyone to hear though, so we thought it was worth sharing with you. 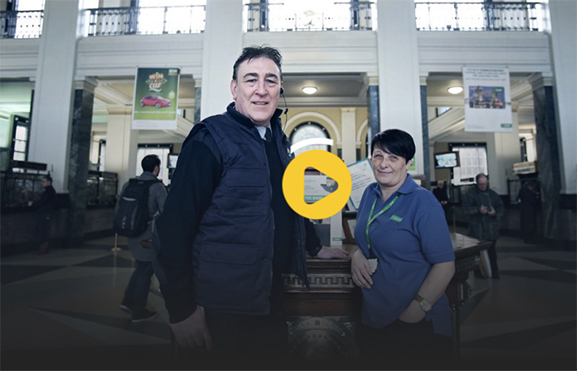 Well… postcrossers do visit post offices rather often, so it’s only natural that a group of enthusiastic Irish postcrossers were picked to be featured on the documentary! Sitting down in a café with their stamps and postcards, Nora (aka ned44440), John (aka jr11577), Claudia (aka chrissybaby) and Kodzos (aka kodzos) braved the cameras and did an excellent job representing the Irish Postcrossing community. Well done guys! You can see the segment (until April 21st) at http://www.rte.ie/player/is/show/inside-the-gpo-30003923/10549881. This is the second part of this series — the first one can be seen here. If you like it so far, do follow RTÉ's website for the next episodes! The Penny Black turns 175! Happy birthday, Penny Black! The world’s first adhesive postage stamp was introduced 175 years ago today, on May 1st 1840, as part of Sir Rowland Hill's postal reforms which paved the way to the modern postal system. 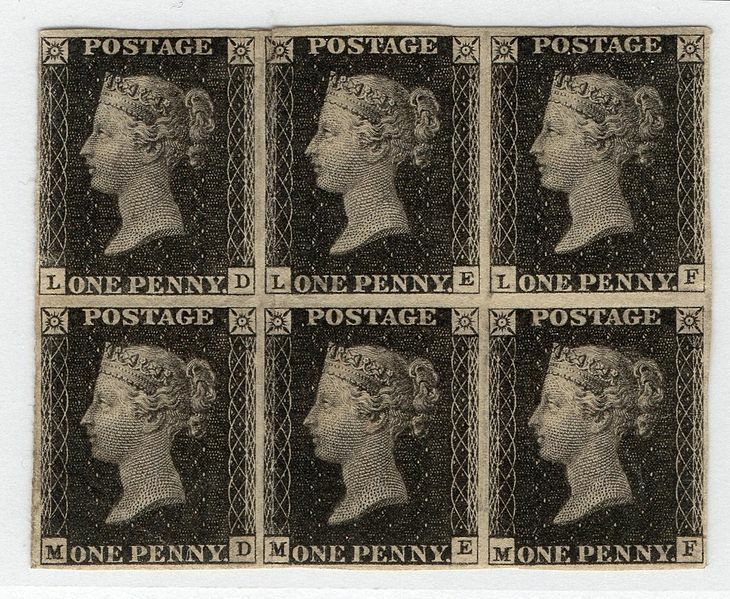 Featuring the profile of Queen Victoria, the Penny Black was sold for just one year, as it was discovered the red ink being used to cancel it was too easily removed… In 1841, it was replaced by the Penny Red, which was easier to cancel using black ink. It’s not a very rare stamp, as over 68 million specimens were printed, but very few complete sheets have survived. The ones that have now belong to the British Postal Museum and you can see them up close on their upcoming exhibition about this famous stamp. It will run from May 6th until August 7th, in London.